FORT CAMPBELL, Ky. --- An Air Force MC-130 barrels through the dry, March air, en route to Dugway Proving Grounds, Utah. Aboard, Marines verifiy target coordinates for an M142 High Mobility Artillery Rocket System chained down beside them. An Air Force loadmaster from 9th Special Operations Squadron signals “ten minutes till wheels down,” as Marines from Kilo Battery, 2nd Battalion, 14th Marine Regiment, operating the HIMARS begin to don their flaks and kevlars, Mar 30, 2018, above Dugway Proving Grounds, Utah. The exercise began the day before at Fort Campbell, Kentucky, where Marines and Airmen practiced loading a Marine Corps HIMARS aboard an Air Force MC-130. In order to get the 7 feet 10.5 inches tall vehicle aboard the aircraft, Marines had to remove multiple components off the top, including the antenna, machine gun, and infrared camera. They also had to lower the suspension and partially deflate the tires. 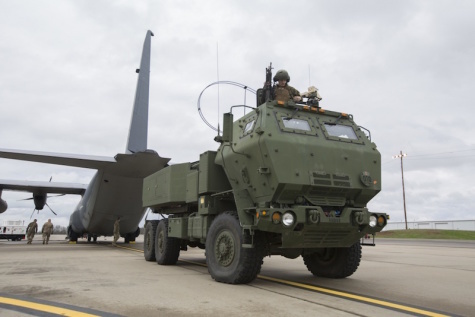 The following morning, the Marines and Airmen took off from Fort Campbell and after a four-hour flight landed at Dugway Proving Grounds, where they off-loaded and reassembled the HIMARS. They then loaded a missile pod and drove to a firing point 1300 meters away from the plane, the minimum safe distance away from aircraft. There, they fired two missiles at one target, readjusted, and fired two more at another, before returning to the plane and flying back to Fort Campbell. The exercise was conducted to demonstrate the Marine Corps’ ability to deploy their HIMARS capabilities and rapidly insert into a combat area via aircraft. This gives commanders precise tactics and missile fire on enemy targets that would be too dangerous to reach directly by aircraft and too far for cannon artillery, giving commanders more options to combat threats. 2/14 is one of two units in the Marine Corps equipped with HIMARS, providing commanders with a versatile weapons platform that can be fired in all weather conditions and locations. It is also equipped with GPS guided missiles giving it the ability to accurately hit targets over 40 miles away. With advances in warfare and the ever-adapting threats against the United States and its allies, Marines must adapt and practice new techniques and tactics to combat these threats. The Marines of Kilo Battery are looking forward to future mission, trying new tactics and staying ready to fight tonight.